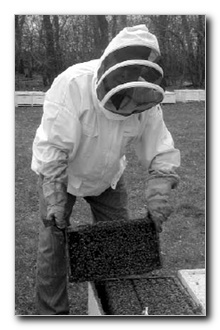 The introduction of commercial beekeeping (the production of a lot of honey) brought a need for equipment that would make taking care of bees easier and more efficient. Uncapping honey was a manual task which took lots of time. When electricity became available, electric uncapping knives came upon the market. However, the Dakota Gunness patented Uncapper makes uncapping faster and easier. The Dakota Gunness Uncapper is operated by using rotating chain flails that cut the cappings from both below and above the frame as the frame passes on a conveyor between the rotating flail. It's been said that necessity is the mother of invention. Donald Gunness, a former Science student can prove it. 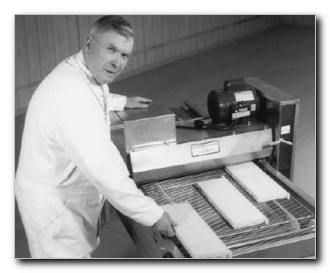 Thanks to an idea spawned at a grocery store, Gunness developed his Dakota Gunne ss Uncapper, a devise used by beekeepers around the world. The machine takes the was capping off the honey cells in hives so the honey can be abstracted. The "Gem Of The Prairie" is built on farm near Abercrombie, ND with the help of local employees. It is a functional piece built of stainless steel and requires little on no maintenance. Our customers say they really love this machine, because all we have to do is run it. Nothing seems to go wrong. The Dakota Gunness Uncapper is relatively compact. It measures six feet long by three feet wide and stands about 40 inches high. Extensions accommodate more extractors, and Gunness has built a few specialty machines for individuals. One such machine was twice as wide and four times as long and could accommodate eight honey extractors.